Again, this is about another stolen idea. The stool that I sit on every second that I’m home when I use the computer has thoroughly scratched up the floor underneath it. 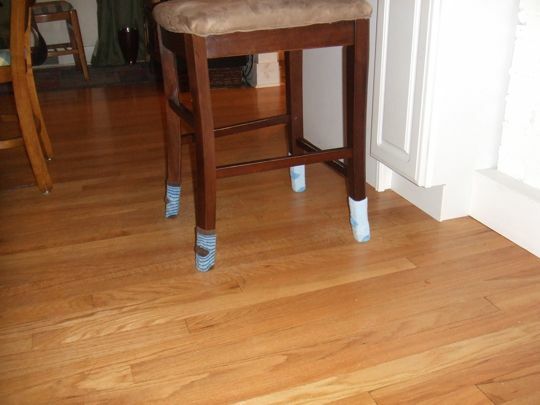 The floors around here are all scratched up anyway, but this was getting ridiculous. I’ve tried those stick-on chair pads, but they keep falling off. Long ago we tried the nail-on kind, and guess what happens when one of those falls off? You have a nailhead that sticks out of the chair leg and really scratches your floor. Back to the stealing. I saw these chair socks and thought they were the cutest thing ever. 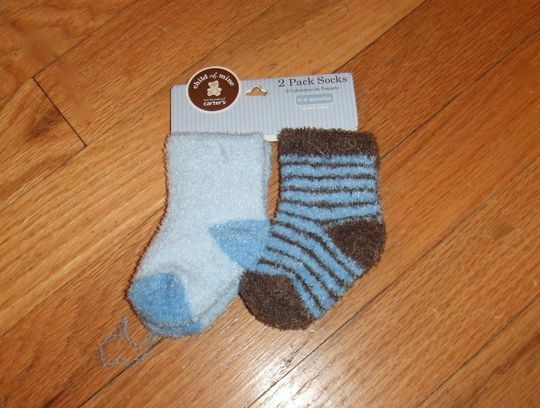 While I don’t want to shell out the money for those, I’m not above spending a few bucks for for some cheap-o baby socks. They’re working out splendidly, though I have to pull them up every so often – just like my regular socks. Hehe…your stool is doing ballet! A one a two..demi-plie, a three a four…don’t scratch the flour. I like how you’ve lined up the heels to make it look like the chair is walking forward.